Labor Day weekend is almost here which means fall is around the corner. Wah wah wah. 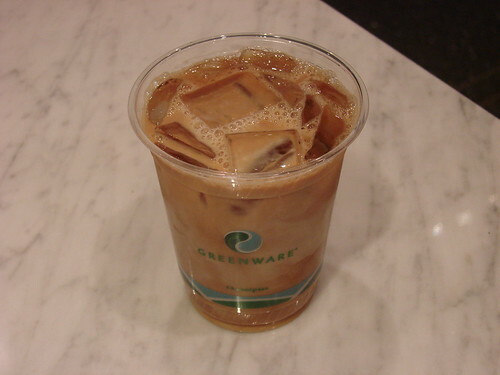 I drink iced coffee year ’round–I’ve found it’s the only way I can tolerate the office coffee, but if you’re a seasonal iced coffee drinker you’ll want to give Blue Bottle’s New Orlean’s style iced coffee a try while the weather is still nice. 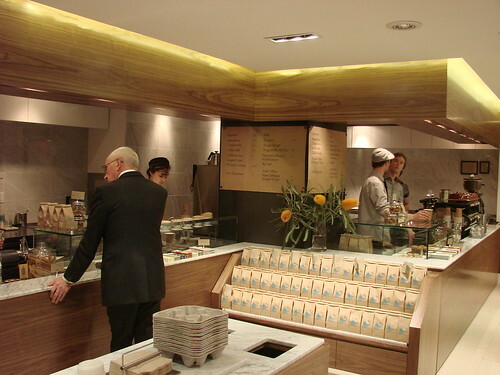 When I first wrote about Blue Bottle opening at Rock Center, more than one commenter mentioned their New Orlean’s style iced coffee. The New Orleans iced coffee will be the death of me. $4 a pop is a tad on the pricey side, but DAMNYUM it’s tasty. The New Orleans style iced coffee is to die for. I travel to all far off parts of NYC to get that stuff. It is amazing and nothing is frou frou about it except for perhaps the price. With praise like that, I knew I’d be checking it out. I’ve never been to New Orleans, so I had to ask, what’s “New Orlean’s style” iced coffee. Turns out it’s a coffee-chicory combo like what they serve at the famous Cafe Du Monde. The coffee is a little bitter and a lot sweet. It has a bit of simple syrup and more than a healthy splash of whole milk, so it’s slightly reminiscent of an indulgent coffee ice cream. At $4 a pop, it’s not it’s not an every day sort of coffee for me, but if you love iced coffee and are looking for a treat, this is for you. Posted by Brownie at 10:43 am, August 30th, 2012 under Blue Bottle, Coffee. Oh my God, someone please halt the importation of chicory coffee into NYC. Okay, maybe not that extreme, but when I was down in NOLA, the chicory coffee I had tasted like someone just decided to burn tree bark and grind it with regular coffee grounds. To each their own but I guess $4 is a decent price to find out if you love or hate chicory coffee. It depends on how much chicory is used in proportion to the coffee and how good the coffee is. If you’re using great coffee and only a little chicory (like blue bottle), it’s great. If you’re just brewing straight chicory though, that’s a much more, uh, particular taste. Whatever blend Cafe du Monde used in their coffee turned me way way the hell off. The beignets are awesome as is any powdered-sugar fried-dough application but I can live my life happily without Cafe du Monde coffee again. I had the single origin iced coffee there on Tuesday. I thought it tasted strong and delicious but was still very acidic for cold brewed coffee. I added a little bit of milk, and that helped. But I would not pay $4 for it again. The single origin was too acidic for me as well, but the New Orleans style is, as mentioned above, to die for. And since they’re the same price, there’s no reason not to order it! Is this a paid Schill for blue bottle? Tasty – Yes. Pricey – Yes. Easily made at home – Yes. Their website even details how to make it at home.